The Quality Payment Program improves Medicare by helping healthcare providers focus on care quality and the one thing that matters most — making patients healthier. The Quality Payment Program combines three existing Medicare reporting systems— Physician Quality Reporting System (PQRS), Meaningful Use, and the Value-Based Modifier— into one, streamlining the experience for clinicians and providing the ability to calculate payment adjustments based on quality rather than quantity of care. The Medicare Access and CHIP Reauthorization Act of 2015 (MACRA) ended the Sustainable Growth Rate formula, which threatened clinicians participating in Medicare with potential payment cliffs for 13 years. If you participate in Medicare Part B, you are part of the dedicated team of clinicians who serve more than 55 million of the country’s most vulnerable Americans, and the Quality Payment Program will provide new tools and resources to help you give your patients the best possible care. You can choose how you want to participate based on your practice size, specialty, location, or patient population. There are multiple data submission options, including Qualified Clinical Data Registries (QCDRs), qualified registries, attestation, or the CMS Web Interface. Eligible clinicians can also submit data using a Health IT Vendor, which extracts data from certified EHR technology; however, in the spirit of flexibility and burden reduction, eligible clinicians can generate a non-certified report in either the new Quality Payment Program file format or QRDA III file format and manually upload the file into the submission system. Ad Hoc is the prime contractor for the Quality Payment Program Front-End Development project, with the mission to maintain and extend the the Quality Payment Program website at qpp.cms.gov. This contract, consisting of one 6-month base period and three 6-month option periods, was issued under the Agile Delivery to Execute Legislative Endeavors for Quality Related Initiatives (ADELE-QRI) BPA to assist the Centers for Medicare and Medicaid (CMS) with agile development services to support the Quality Payment Program (QPP) initiative. Ad Hoc won a spot on this BPA in September 2016, and this is our first task order under it. The Quality Payment Program (QPP) is a brand new product driven directly from legislation. The software requirements are derived from an 824-page piece of legislation. Ad Hoc collaborated with policy teams to interpret legislation, regulations, and CMS business operations into one smooth user experience. System login based on existing Enterprise Identity Management (EIDM) credentials. Authorization using legacy roles, so users have less work to do setting up permissions on day one. All static Web pages explaining how the QPP system works. Review, select, and download measures that best fit your practice. Check if you need to submit data to MIPS based on National Provider Identifier (NPI) number. Currently just MIPS, soon everything. Successfully report data in any category on behalf of any entity for which the user is authorized. This includes a view of eligibility by practice, which is more user-friendly for the clinicians completing the submission. As data is entered into the system, users see real-time initial scoring within each of the Merit-based Incentive Payment System (MIPS) performance categories. 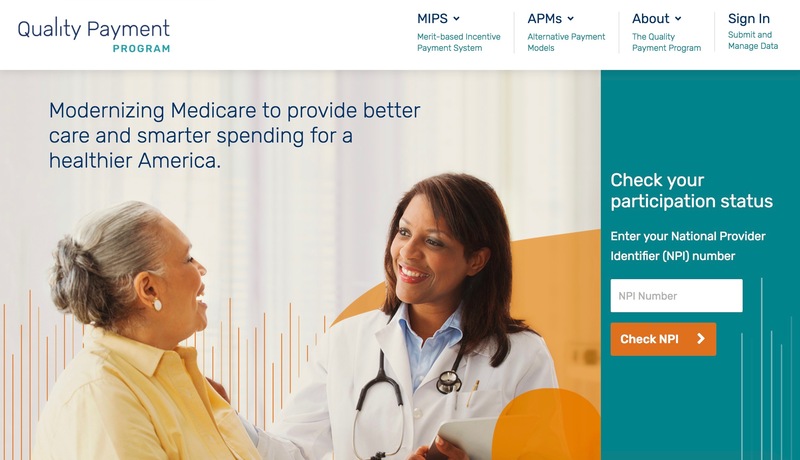 CMS Launches Data Submission System for Clinicians in the Quality Payment Program: January 2, 2018 press release from Centers for Medicare & Medicaid Services (CMS) announcing the launch of the Quality Payment Program website (qpp.cms.gov). Group and/or Individual data submission for MIPS: January 2, 2018 screencast by Centers for Medicare & Medicaid Services (CMS) providing a walk-through of all features of the Quality Payment Program website (qpp.cms.gov). Submitting 2017 Transition Year Data to the Quality Payment Program: Fact sheet on the Quality Payment Program data submission system published by Centers for Medicare & Medicaid Services (CMS).